.. small area data providing information on sub-county and sub-city/place geographies are challenging to locate and use — particularly in context of demand for healthcare services and demographic attributes of associated neighborhoods. Develop insights into the healthcare infrastructure by ZIP code using the two related resources reviewed here — 1) individual ZIP code demographic-economic profiles and 2) ZIP code demographic-economic interactive tables. One way to examine the healthcare infrastructure for an area is to view/analyze the number and attributes (employment, earnings) of healthcare establishments by types of business/industry (such as physicians office or hospitals). Data and tools reviewed here provide insights into characteristics and patterns of national scope ZIP code areas — examine your ZIP codes of interest. 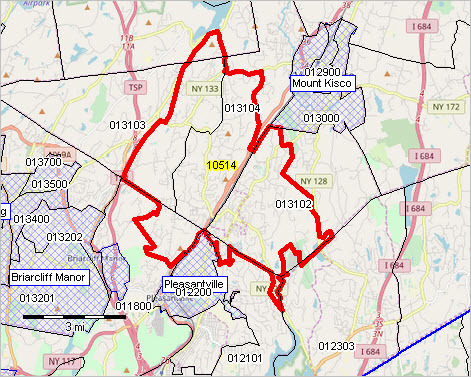 .. examining the healthcare infrastructure in context of the related demographic-economic situation … the following graphic shows ZIP code 10514 (Westchester County, NY) with a bold red boundary. Census tracts are shown with black boundaries with tract codes as white labels. See more about ZIP-Tract relationships. Cities/places are shown with blue cross-hatch pattern. – view created with CV XE GIS software and related GIS project. The portion of the table shows the NAICS/type of business code at left, followed by type of business description and the number of establishments at the right. Examine other characteristics of this ZIP code profile and in context of others via this related Web section. These profiles update in May 2018. .. examining the healthcare infrastructure for a set of ZIP codes in a state, metro, county or peer group … use the interactive table located here to view/rank/compare health care business establishments by type of business for a selected set of ZIP codes. This table shows a query placed on the table to show the total number of offices of physicians for ZIP codes in the vicinity of ZIP 10514. It shows that there are 14 offices of physicians establishments and 13 have 1-4 employees. Data used to develop the tools/resources described above are based in part on the Census Bureau County Business Patterns program. These establishment data update annually.